San Diego Comic-Con 2018 is upon us! AGP is traveling to SDCC this week with a brand new teaser cover for NICE courtesy of the incredible Tula Lotay, who will be appearing on the Famous Monsters panel alongside AGP to tease more art for the title and outline FM and AGP’s plans for the remainder of 2018! The world’s oldest monster brand celebrates 60 years of scares by marching into a new multimedia deal with Echo Lake Entertainment! 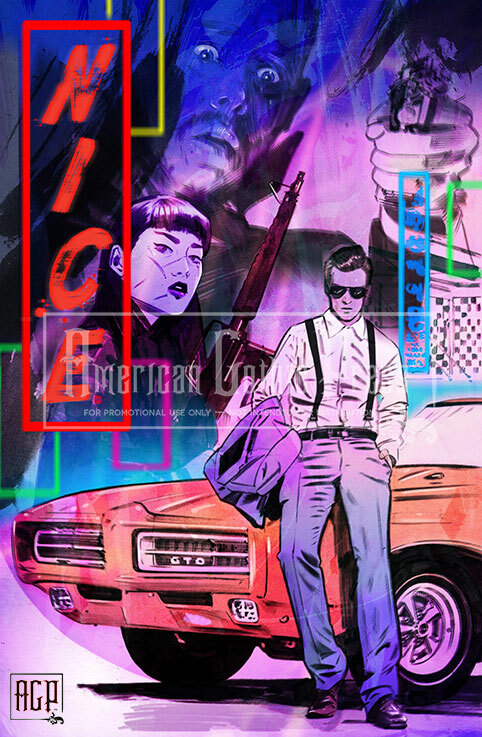 Publisher Philip Kim and editor Holly Interlandi announce the American Gothic Press adaptation of violent crime spectacle Nice alongside the creative team: writers Joseph Ettinger(Santa Clarita Diet) and Dagen Walker (Atomica), showrunner Rockne S. O’Bannon (Farscape), director John Terlesky (Agents of S.H.I.E.L.D. ), interior artist Marc Rene (Oak Island), and cover artists Tula Lotay (All-Star Batman) and David Mack (Jessica Jones). Also featured on the panel will be Face Off’ s Walter Welsh giving insight on the final season of SYFY’s hit monster makeup show. Everyone attending the panel will get a free gift! Moderated by Matt Corrigan of the Launchpad Podcast. We hope to see you at the panel!